The Focus 120 (F120) is a third generation small animal PET scanner produced by Siemens Medical Solutions, Inc (formerly CTI Concorde Microsystems). F120 consists of 96 scintillation detectors, arranged in 4 rings, with a 14.7 cm diameter and a 7.6 cm axial extent. Each detector consists of a 12×12 array of 1.52×1.52×10 mm Lutetium oxyorthosilicate (LSO) crystals optically coupled to a position sensitive photomultiplier tube (PS-PMT) via an 8×8 bundle of square optical fibers. 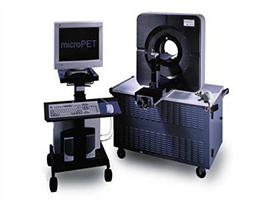 The animal port diameter of the F120 microPET scanner is 12 cm with 7.6cm radial field of view (FOV) and a 10mm axial FOV allowing imaging of the brain of a rat or the whole body of a mouse. Collaborators wishing to conduct a study using the microPET Focus 120 are encouraged to read our page on how to start a new study.